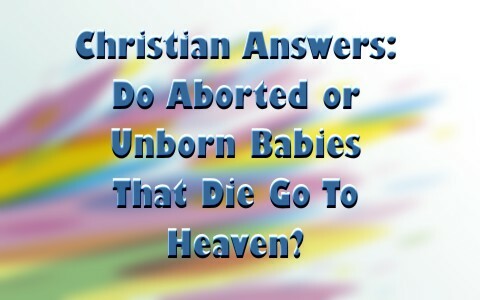 Do Aborted or Unborn Babies That Die Go To Heaven? One of the most heated topics that people discuss is the topic of abortion. While some argue they have a right to choose to kill an unborn child, others are devastated when their unborn child dies through no choice of their own. However, at some point, the question of what happens to the person that was that child will be asked either openly or in thought. For this reason it is important that we know how to answer the question, do aborted or unborn babies that die go to heaven? What is God’s attitude toward children? In the first passage Jesus pointed out two things about children. The first is that He uses the example of a child as an example of how someone must be to enter the Kingdom of Heaven. According to His example, they must be converted to a state of innocence. To do this he or she must humble them self, meaning that they must be willing to acknowledge that they are but children in light of God’s wisdom and power. This leads to Godly repentance that leads to everlasting life through trusting Christ as their Savior (2 Corinthians 7:9-10; James 4:8-10). In the second passage we see the parable of the lost sheep, which most people think is about a backsliding Christian. However, in the context of Matthew 18, it is speaking about children who have not trusted Christ when they reach an age of accountability. These children, once in a state of innocence, have grown to a point where they are now held accountable for their sin and have not trusted Christ as their Savior. They were lambs, who grew to be sheep and are lost on their way to Hell. This points to the fact that children (lambs) who grow up to be adults (sheep) without the understanding of the need for the Great Shepherd are of great concern to God. So much, that God has appointed a guardian angel that is always before the face of the Father, ready to intervene, especially if someone leads a child astray. When the child trusts Christ as their Savior, there is great rejoicing in Heaven over the fact that this child has now been returned to the flock. When is a baby or child conceived? There is no doubt in medical research that at the moment of conception the one-celled gamete, from where we get the term mate, contains everything genetically that makes it human. Some may refer to it as a cell or a clump of cells, but the fact is, when referring to the term conception, it is clear if one asks what was conceived. A cell? A clump of cells? No, it is clear that the answer is a baby or a child. Biologically speaking, the only difference between this child and newborn is its size and complexity of development. The answer to this question is often used to justify aborting a child in the first trimester. The thinking is that the child does not feel pain nor have the ability to formulate thoughts so he or she is not a person. At least, that is what they think, given the limited knowledge we have about prenatal thoughts and emotions. The invention of 3-D ultrasound put to rest similar arguments about physical growth and development that were used to justify aborting a baby. However, like psychology, knowing the innermost thoughts and understanding of a child is made more impossible by the fact that the child is in the womb. Some would then suggest that we can measure brain waves, to know for sure when there is a thinking person in the womb. However, this is assuming that consciousness and awareness can only be measured by brain waves. The person was conceived at the moment of conception (Psalms 51:5). The conceived person existed and was covered with a body (Psalm 139:13-16). God knew the person before they were conceived and born (Jeremiah 1:5; Psalms 22:10-11). God has a plan for a person before they are born (Isaiah 49:5; Galatians 1:15). What happens to an aborted or unborn baby when it dies? Given the context of everything we have seen, it is clear that God would not forsake an aborted or unborn child that dies. Likewise, He does not forsake a child that has not reached the age of accountability either. The very notion that God would condone the barbaric killing of a child is clearly rejected in numerous places in Scripture (2 Kings 17:16-18; Psalms 106:35-38; Matthew 18:6). With this in mind we find a clear example of what happens to a child when it dies in 2 Samuel 12:13-23. Because of David’s sin in committing adultery, the Lord decided to take the child from David and Bathsheba within a week after being born. During that time, David fasted and prayed that God would spare the child’s life. However, on the seventh day, before the child could be circumcised, the child died. In this simple statement we learn two things. The aborted or unborn child that dies, along with all children that die not reaching the age of accountability, are in heaven. It also tells us that the same are not in a state of “limbo,” as some believe, or else David would not be able to “go to him.” David knew that the baby was in the loving care of the Heavenly Father. He also knew that one day he would see the baby again. Thanks be to God! God holds a special place in His heart for children. He has appointed guardian angels over them and is willing to execute wrath upon those who harm children. A child is conceived at the moment of conception. The child also becomes a person at the moment of conception. Despite this, God knows each child even before they are conceived and He has a plan for each one. When an aborted or unborn baby dies, it is immediately absent from the body and present in the Lord’s loving arms and protection. This truth makes religious rites and rituals of no effect when it comes to the eternal destiny of any child who dies not having reached the age of accountability. For those who have lost or chosen to abort a child, God’s grace is available so that one day you can spend eternity with your child. Related reading: What Does the Bible Say About Abortion? Thank you for such a thought-provoking and well-grounded article. I have 2 beautiful children, born via IVF. I have 3 ’embryos’ frozen. I am now 44 years old and cannot go through another pregnancy, let alone afford another child. What of the frozen embryos? I will not destroy them or donate them to scientific research. These are my children. I am unable to bring myself to donate them to a childless couple, as I will (selfishly) forever be worried about what is happening to them, where they are, if they are happy and safe. In addition, I will not be comfortable knowing that a full blooded sibling/s of my children is/are out the somewhere. I know they will want to find them someday, or will wonder whether each child they meet may be their sibling. I don’t want to do a ‘compassionate transfer’, where the embryos are transferred into my uterus at a time of the month when there is little to no cervical lining for implantation, knowing they may likely perish. It’s also risky in that I may become pregnant again. I know I am being very selfish here, as it is all about the way I feel about these options, but I cannot do any of these things. My desire for children took priority over the knowledge of these issues. Please let me know what I ought to do. I have prayed that someday I would be guided into making the right, Godly decision and be at peace with it. I also hope to win the lottery so I can afford to support the other children! There are millions of spare embryos banked around the world… little children frozen in time, waiting for their parents to make a decision on their fate. you will always make the wrong choice if you let your emotions make it. And allow God to have control…They are after all ‘his children’. The right choice is the hardest if you are doing it alone, trust the Lord! By “other children” are you referring to your two children in your home right now, or the potential births of the embryos? If the 120.00/month isn’t a concern(for storage of the three embryos) then waiting is an option. Wait until you are gone and place it in your will that you wish a Christian third party(your children, church or Christian adoptive service) to take care of adoption for you. Since we both believe the embryos are viable, are children, and are deserving of live birth(do you believe this last reality? ), then if you cannot emotionally “handle” them being raised outside of your control, while you are living, then wait until you are gone. I am not an attorney but find one(Christian) and let your concerns be made known, if you haven’t already. I would think you should spell out in your will(do you have a living Trust/Will?) that you wish your children to seek out an adoptive or surrogate mother to bear the embryos once you are gone. If you can, leave enough money in your will to pay for the embryos expenses(monthly storage). 1)Do you believe these embryos are deserving of live birth, or should they be in this state of suspended animation indefinitely? 2) If they deserve birth, then, do you believe your fears overrule their opportunity for birth? If yes, then wait. If no, then seek out the means for their live birth, through these means discussed. Thank you so much for taking the time to answer my questions and for your invaluable input. And thank you for keeping me In your prayers while I wrestle with my decisions. Your suggestions have given me a lot to think about. I live in another country and the annual storage fee is minimal. When I talked about winning the lottery, my point was that if money were no object, I would provide the remaining embryos (children) a chance at life right away. So yes, I do believe they are deserving of life. I could not bring myself to destroy them. I need to check what the agreement says that I signed with the lab when the embryos were frozen. I’m not sure what it says about what happens in the event of my or my husband’s death. But I will seriously consider the option of including them in my/our will. I am sure you must be wondering what my husband’s thoughts are on this. Well, he sticks his head in the sand and doesn’t want to talk about it. I’m not sure what his feelings would be about the idea of including them in a will, but will broach the subject with him. Thank you once again. I am truly grateful that God pointed me to this site for answers. If I might add another thought, I would definitely have the remaining embryos genetically tested to see if they are viable. IOW, if they have the potential/ability to survive throughout the gestation period. Your medical facility where they are at should be able to do this for you. I have just been thinking about this the last day or so. You have fully answered my question especially when the child is in the womb. The one I want to know about is what if their is a miscarriage it`s not a pleasant thing,but the baby is all mashed up. In Prayer one morning I ask God..”When does he consider a Life to be a Life” His answer was.. “At which point during Mary’s pregnancy, if something had gone wrong, would I have not called my son home?”… So God considers a Life to be a Life, at the moment of conception…..